Francophile or not, tuning in to the French network TV5MONDE may bring a new perspective to living in and visiting the Wood River Valley. The network's travel show "Across America! "—or "L'Amerique Dans Tous Ses Etats"—is a documentary series that follows host, co-writer and co-producer Gerard Klein. 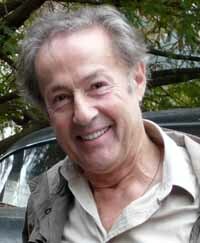 Klein is a French actor and celebrity known for his television series "L'instit," in which he portrayed Victor Novak for nine seasons and for which he earned great acclaim. He also appeared in more than a dozen feature films, including Roman Polanski's "Frantic," which also starred Harrison Ford. Klein began his career in 1967 as a radio host. "People in France say they love and trust me," Klein said. "I have worked in radio and television for a long time." Klein said the series is about showing America to France. "Most people in France like Americans and want to know more about America," he said. "TV5MONDE is in French and it's also for people who want to speak French. It's a good thing and can be seen all over the world." During Klein's visit to the Wood River Valley, he spent time with Jack Sibbach, Sun Valley Resort marketing director, and Michel Rudigoz, proprietor of Michel's Christiania restaurant in Ketchum (also known as "the Christie"). "I had a lot of fun with Michel," he said. "We talked about the Olympics and the many U.S. gold medals won by his athletes." Klein said he enjoyed eating at the Christie and hearing stories about Ernest Hemingway and Gary Cooper. "I met [rancher] Bud Purdy, who was a very good guy and friends with Gary Cooper and Ernest Hemingway," he said. "I went to Bud Purdy's home and he showed me his gun that Hemingway gave him. He told me hunting stories about him, Hemingway and Gary Cooper." Klein said Purdy showed him pictures of the Marlboro cigarette commercials that were filmed on Purdy's ranch in Picabo. "Sun Valley is wonderful," Klein said. "The visit to the lodge was fantastic and the potatoes are so big." Klein wants to come back in the summer for fishing. He said the people and the hospitality were first-rate, and Sun Valley is much more interesting than Aspen, Colo.,because it has such a rich history with celebrities. "For French people, Sun Valley is beautiful," he said. "I want to come back because of the landscape, people and fishing—there are two shops just for fishing." "Across America!" allows French people and all Europeans an opportunity to get to know American people and who they are. Klein and his crew plan to visit all 50 states—so far, they have traveled through 16. He said other interesting aspects of visiting Idaho were meeting a Mormon family and Nez Perce tribe members. "I tried to talk in the Nez Perce language, but it's hard to do as a French person," he said. "It was not possible. I learned the word for potato is a Nez Perce word." Klein said Americans can learn about themselves from this show. In the premiere episode, Klein visited rancher and writer Dan O'Brien, who has been reintroducing buffalo in the Black Hills for 20 years, at his ranch on the Cheyenne River in South Dakota. He also took a trip to Wyoming's Devil's Tower, the national park featured in Steven Spielberg's "Close Encounters of the Third Kind." From the buffalo of South Dakota to the electric cars of Silicon Valley, from the marshes in Florida to the volcanoes in Hawaii, Klein and his crew have met with local residents to explore the vast nation and discover unknown traditions and histories of America. "It allows us to visit and meet people," Klein said. "Our wish is to be aired on an American channel." "Across America!" debuted in April 2011 on TV5MONDE. The show, which includes subtitles, is televised twice weekly on Saturdays at 4:30 p.m. MDT and Thursdays at 11 a.m. MDT. New episodes continue to air, and will include Klein's visits to Idaho on Saturday, May 14, at 4:30 p.m. TV5MONDE is available on the Dish network, a network of eight different channels serving countries around the globe.